Elk once roamed the southern Appalachian mountains and elsewhere in the eastern United States. They were eliminated from the region by over-hunting and loss of habitat. The last elk in North Carolina was believed to have been killed in the late 1700s. By 1900, the population of elk in North America dropped to the point that hunting groups and other conservation organizations became concerned the species was headed for extinction. 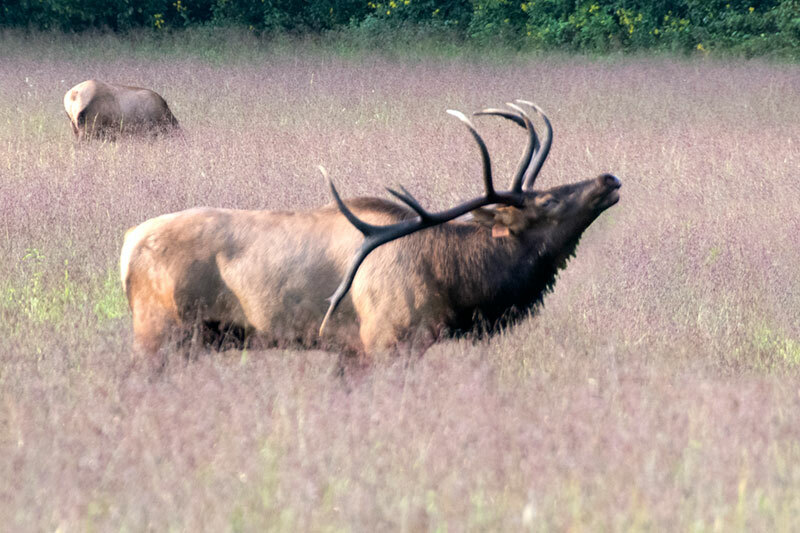 The elk were re-introduced into the Park in 2001 and 2002. For the first few years, elk watching meant driving deep into the Cataloochee area of the park, about 1.5 hours from Bryson City. But over the past decade, the herd has grown and spread into other parts of the park. Cherokee Elk. 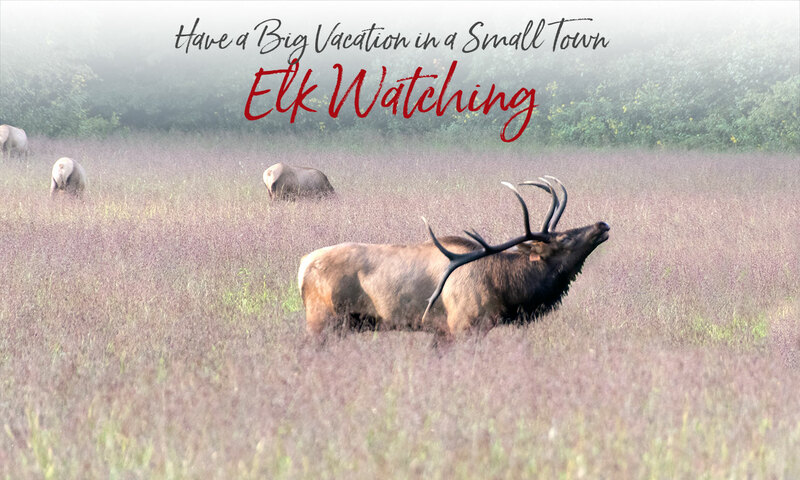 These days, you’re just as likely to see elk grazing in the fields next to the Oconaluftee Visitor Center, in the lowland fields about 1 mile up US 441 in the National Park, or in the Job Corps Civilian Conservation Center area just north of the visitor center. Occasionally, when walking the 1.5 mile (each way) Oconaluftee River Trail, elk can be spotted in the water and on the trail, especially in fall. Another option is the area around the Cherokee schools complex, about 1.5 miles up Big Cove Road. Just beyond the schools the Eastern Band of Cherokee Indians has created a grassy area and garden just for the elk. The animals are not frightened by humans and can be observed grazing in the low-lying fields almost any afternoon throughout the year. In spring and summer you may spot them in the early morning or late afternoon. In the winter most of the males go up into the mountains, although you might see an occasional lone bull around town. The females and calves winter in smaller groups. You may see them earlier in the afternoon, around 3 – 4 pm, just when shadows start to come in, although viewing is unpredictable in the winter. The groups reform in spring. 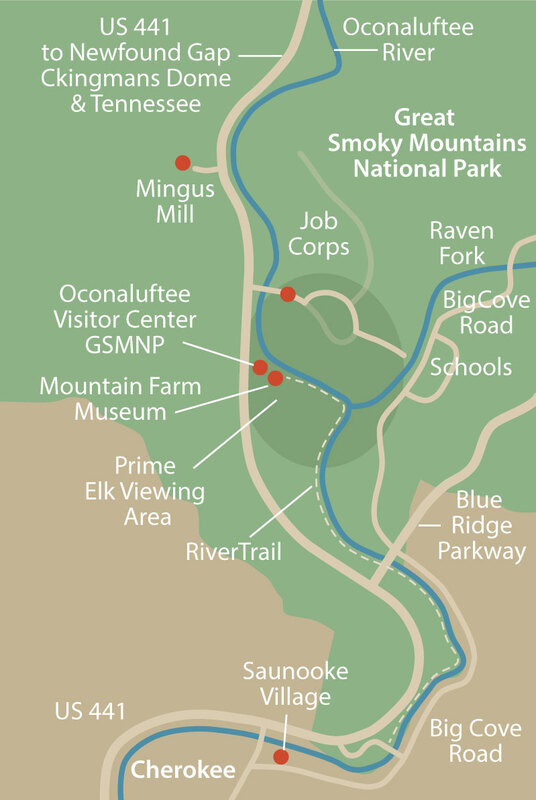 The Smokies elk were first reintroduced in 2001 in the remote Cataloochee area of the national park. A large portion of the herd still resides there. Cataloochee is north of Waynesvile, a 1.5 hour drive from Bryson City. More about the Cataloochee elk. Hearing a bull elk’s bugling during the fall rutting season is a memorable experience that comes with a caution. While the animals are not frightened by humans, they are wild and potentially dangerous, particularly during mating season when the males are aggressively guarding their harems. Observers should get no closer than 50 yards and use binoculars or telephoto lens for closer views.